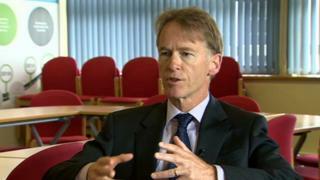 The chief executive of Wales's environmental watchdog is to retire. Dr Emyr Roberts has led Natural Resources Wales (NRW) since its formation in 2013, when three environment bodies were merged. Against a backdrop of reduced funding and staff numbers, it has faced a number of difficult headlines in recent years. Diane McCrea, chairwoman of NRW's board thanked him for his "huge commitment and hard work". Dr Roberts is set to stand down in October and work to recruit a successor will start immediately. He said leading the NRW had been a "tremendous privilege" and it was "making a difference". "We have achieved a lot in terms of setting up a new organisation capable of transforming the way we look after the environment in Wales, and I feel that now is a good time to hand over the baton to someone else to lead the next phase of transformation," he added. "My thanks go to our great people and everyone associated with NRW and I wish it well in its future important work." NRW is the largest Welsh Government-sponsored body, employing 1,900 staff across Wales with a budget of £180m. It was formed out of the Environment Agency, Countryside Council for Wales and Forestry Commission Wales. The aim was to manage the environment in a more joined-up way while keeping a distance from the Welsh Government. However a year in, wildlife presenter and naturalist Iolo Williams had branded it a "disaster for conservation", with NRW's independence called into question over support for a motor racing track near Ebbw Vale. WHO IS DR EMYR ROBERTS? Born in Benllech, Anglesey, Dr Roberts took a degree in geography and economics at Reading before completing a PhD in rural deprivation at Aberystwyth University. He worked for the National Farmers Union for nine years, ending up its deputy director, and then as a civil servant at the Welsh Office from 1991. He became chief executive of the Welsh European Funding Office in 1997 and then worked for the Welsh Government in senior civil service roles from 2005 until becoming the first chief executive of NRW in late 2012. It took over the functions of Countryside Council for Wales, Forestry Commission Wales and Environment Agency Wales from April 2013. When he took over the role, Dr Roberts said the body would work closely with ministers but maintain its distance. He said it would be a "close relationship" but also "an arms length relationship." It became evident that merging different organisations was proving to be a huge challenge. Leaked staff surveys came under the spotlight and claims of deep morale problems were made. The 2016 questionnaire suggested that just 10% of workers felt the organisation was well-managed. Dr Roberts had responded to say the transition within the new organisation had been "challenging". Most recently a row over a £39m timber deal that was not put out to tender prompted criticism from the Auditor General for Wales and an investigation by the Assembly's Public Accounts Committee. The timber industry complained of "an extremely worrying loss of forestry expertise" within the organisation, while fishing and river groups also attacked NRW, branding it "no longer fit for purpose". The allegations were strongly refuted by NRW. In the organisation's annual report for 2015/16, Dr Roberts described the process of integrating the work of three legacy bodies as an ongoing "journey" but emphasised that NRW had so far delivered a "credible performance". Successes included cleaner bathing waters, work to protect peat-lands and reduce the spread of tree disease. More data was being published online, such as information on river levels, "helping our stakeholders make decisions". Meanwhile, customer service was continuing to improve, he said. Diane McCrea, NRW chairwoman, thanked him for his "huge commitment and hard work in leading Natural Resources Wales over the last five years". She added: "I will begin the process to recruit his successor immediately. My priority is to ensure a smooth handover, and provide the necessary leadership for our wonderful staff. "In the meantime, our work continues as usual looking after the fantastic environment we all love, so that wildlife and people in Wales can thrive. "We are lucky to have such talented, skilled and passionate people working here and I thank them for everything that they do." Cabinet Secretary for the Environment and Rural Affairs Lesley Griffiths added: "Bringing together three organisations and creating an effective regulator and delivery body has been no mean feat. "While the organisation is still in its transformation stage I would like to thank Emyr for his hard work reflected in the achievements of NRW thus far. I wish him well and hope that throughout his retirement he will continue to contribute to the wellbeing of the people of Wales."